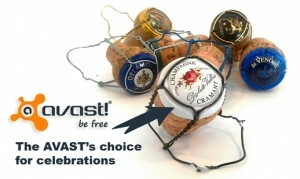 We face quite a dilemma every time we have something worthwhile to celebrate here at AVAST. For example, when we reached 100M and then 150M PCs users, when we launched a new product, or when this new free product achieves better detection scores than paid-for competition. Since we now have a solution for mobile security we of course also celebrated the launch last December and then we celebrated reaching 10M protected phones less than a year later. We celebrated seeing our Facebook fan club growing by 300 000 in a single day and sure enough we will celebrate when our fan club reaches 2 million as it is getting closer to every day. The problem is… celebrated with WHAT? Until recently, we were depending only on the Moet brand of champagne. The last festivity saw over 50 bottles of Moet go by, and frankly all the stores around us were getting depleted. It was time to look at the matter and find some better alternatives. And so we did. Yesterday. With the help of “House Champagne” and their leading sommelier Mr. Ales Pokorny, we sampled some very good bubbles from Delamotte, Diebolt Vallois, Jacquart, Bernaut, and other family-brand champagnes. It was a nice sunny day here in Prague and the terrace on top of the AVAST building was a very suitable place. A way to invest the afternoon indeed. By the way. The winner is “Diebolt Vallois Tradition” and we are being assured the local importer has sufficient stock on hand and can deliver within hours.